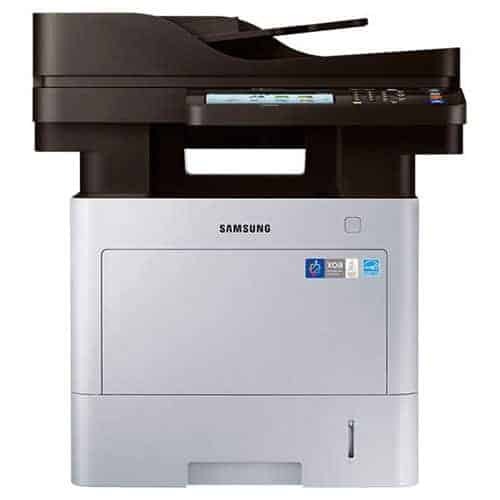 Samsung M4080FX Monochrome Multifunction ProXpress - Perfecta Business Services, Inc.
Print productivity and cost control are top of mind for today’s small and medium businesses (SMBs). They require high-speed, easy-to-manage print solutions that drive cost efficiency and reliable, secure operation for minimal downtime, maintenance and risk. The Samsung ProXpress M4080FX multifunction printer (MFP) produces professional-caliber prints and scans with ultimate performance and versatility. A 1 GHz dual-core processor and Dual-Scan Document Feeder (DSDF) technology deliver ultra-fast printing and scanning speeds. What’s more, it easily handles heavier papers for less maintenance and downtime. Perfecta Business Service, Inc., a women-owned business member of the Small Business Association, has built an unmatched reputation for providing outstanding products and services throughout Massachusetts and Rhode Island. © 2019 Perfecta Business Services, Inc.